Venice Pest Control has proudly provided residential and commercial pest services in Sarasota and Charlotte Counties for 40 years. Our company is local, family owned and operated. Our clients are always our top priority. We have decades of experience with all of southwest Florida's most troublesome pests, and we can quickly put a stop to any flea problems that you may have. Fleas are small, wingless parasites that sustain themselves by feeding on the blood of birds and mammals. Many people associate flea infestations with dogs and other pets, but these insects can become a problem in almost any building with human inhabitants. They get inside homes and businesses by hitchhiking on clothing or on the bodies of other pests such as rats and squirrels. Once they get inside, fleas will immediately begin breeding and searching for hosts. Fleas breed quickly, and a single female flea can lay dozens of eggs per day. Flea bites leave itchy rashes on the skin and are typically found on the feet and ankles. Their bites are especially uncomfortable for people who are allergic to their saliva. Scratching at the bites can break the skin and lead to bacterial infections, and fleas are known to transmit a number of dangerous diseases. 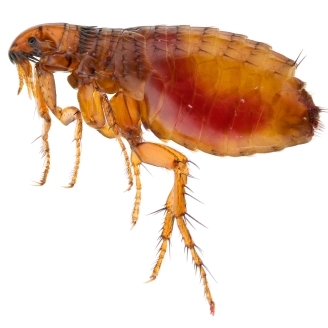 If you suspect signs of a flea infestation in or around your home or property, contact Venice Pest Control. Our pest control experts will determine the nature and extent of the infestation and provide a complementary flea control service estimate.